Waste ash What is left over from a fusion reaction is a neutron which has four fifths (80%) of the energy, The other one fifth (20%) of fusion energy is very high energy helium nucleus (called an alpha particle, usually written α). 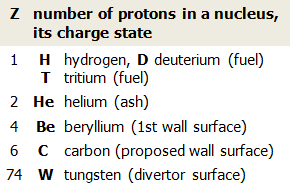 Neutrons will be captured in the wall blanket, combine with lithium (Li) there and form new tritium (T) for fuel. Neutron energy will be converted to electrical power and sent to the grid. Alphas are very hot when formed, and will slow down in the plasma, passing its excess heat to the fuel, and supporting fusion temperatures. This is what is meant by ignition. But the slowed α’s become a problem. If there are too many α’s, they will radiate significant power from the plasma and cool it down. The slow α’s are called the fusion ash. Ash must never be more than 10% of the plasma,or the ignition will quickly quench – the plasma will sputter out. The problem with waste Ionized materials in a plasma radiate power proportional to the ion’s atomic number (called its Z value) squared. This is a fusion “poison” because the energy needed to heat the fuel can be radiated away by the high Z contaminant before fusion temperatures can be reached. Comment 3 shows various Z values. The divertor The design must address the issue of waste heat/ash eroding its surface, even forming a cloud of cold waste gases just above it. If not handled properly, this stuff could back-diffuse into the plasma and enter the confinement region. The fact that the × point of the separatrix is located inside the divertor volume is good design. This has been shown in current tokamaks (current, smaller machines) to be effective at collecting much of the waste moving through the SOL as possible. Exhaust path The exhaust path from the front target surface to the huge exhaust ducts is blocked by the cassette body; although flow conductance of the duct is good, the overall conductance between the target surface and the pumps will be limited. Few tests, though have been done when the central core was at fusion temperatures. And no tests have been done on a machine that runs fusion plasma for 10 minutes. Previous tokamak tests all used cryogenic pumps very close to the divertor target surface. Cryopumps have very cold surfaces that freeze gases onto them. They do not pump helium and saturate with extended use at high pressure. 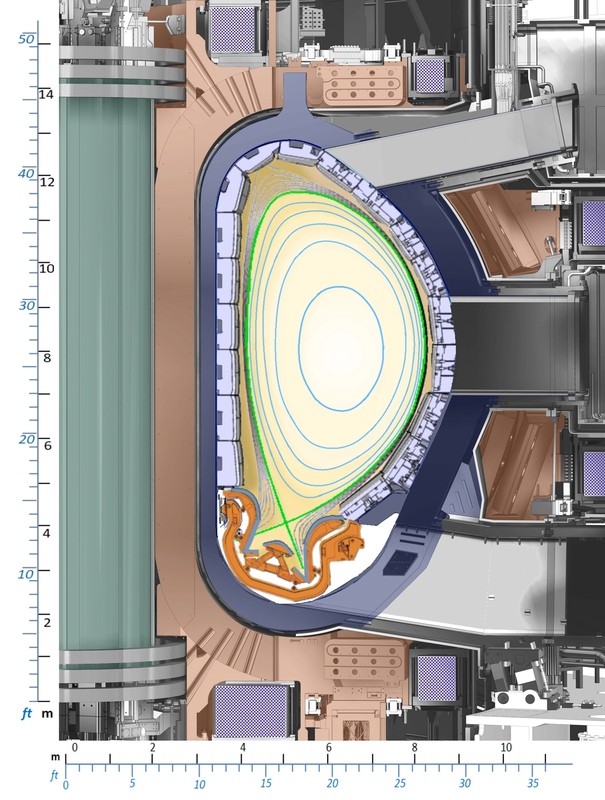 Cryos are completely unsuited for for ITER, which must use turbomolecular pumps connected by very long ducts. But even high performance turbopumps do not pump helium very well. First problem If a stagnation cloud of ash develops in front of the divertor, the chance is good that part will flow back into the confinement region, especially during a long pulse. Second problem The huge power load onto the divertor’s target front surface is expected to be factors of 10 larger than in any current machine. The divertor target surface will erode much faster than seen anywhere before and may result in substantially higher high Z contamination of the central fusion region. Both problems would be a threat for successful net power generation. Why not do actual tests on a current tokamak? People have been doing them for the past 40 years, at least. But no existing machine can test all of the proposed divertor strategies because they cannot generate 150 M degree plasma that lasts 15 minutes. Also, certain strategies require more space in the chamber room than currently available. This insufficient data set is what worries me. History is littered with rejected proposals for divertor test machines. Recently, Nature (July, 2017) reported that an Italian request for funding of a new divertor test tokamak had been postponed or denied. But some new test programs are starting up. The superconducting Tore Supra (down the road from ITER) was rebuilt and recommissioned (December 2016) as WEST (the W means tungsten); China has EAST to run with W-Be alloy walls; there are others. 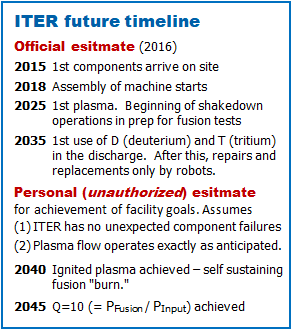 ITER is being manufactured; can new tests help? The physics/engineering community have always worried about protecting the walls from the plasma waste at initially tried shields of high melting point metals. That worked, but high Z contamination was a problem. People have known how to build divertors that work for over 35 years. 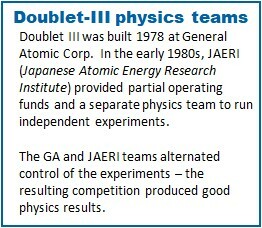 In 1982, General Atomic’s Doublet III teams published results from their tests with different divertor configurations. Fig 2 was colorized from the GA 1982 Annual Report – TF coils copper tone; magnetic field shells blue lines; separatrix green line with the × point. The primary limiter shielded the walls, and always poisoned the discharge. Divertor shots have the (unused) limiter outside the separatrix. Most edge plasma rapidly streamed to the × point, then outwards. Fig 2(B) The expanded boundary (XB) spread the plasma power from the × point through the lower volume to reduce the intensity when it struck the wall. It was the idea of GA’s Nobuyoshi Ohyabu (currently at Japan’s LHD facility): Expanded boundary approach to impurity control in tokamaks, Nucl Fusion 21 519 (1981). Fig 2(C) The JAERI technique pulled the × point well below the core and spread the exhaust onto the inner wall, then into the lower volume, Comment 4. Both techniques worked well at reducing the high Z contamination of the plasma. The key is that the entire lower chamber was available to expand into, significantly reducing the impact intensity. These tests have been called the “the first advanced magnetic divertor configuration experiment” (see p29 of this Soukhanovskii link). Expanded boundary divertors are one of the few correct paths for long pulse tokamaks (Comment 5). 3. Why are divertors still and issue? (1) Cost reduction – ITER was too expensive and was reduced (1997) by reducing size. An XB as in Fig 2(B) would have made the chamber and TF coils twice as big, twice as expensive. (2) My suspicion – Certain people believed divertors importance was overblown. 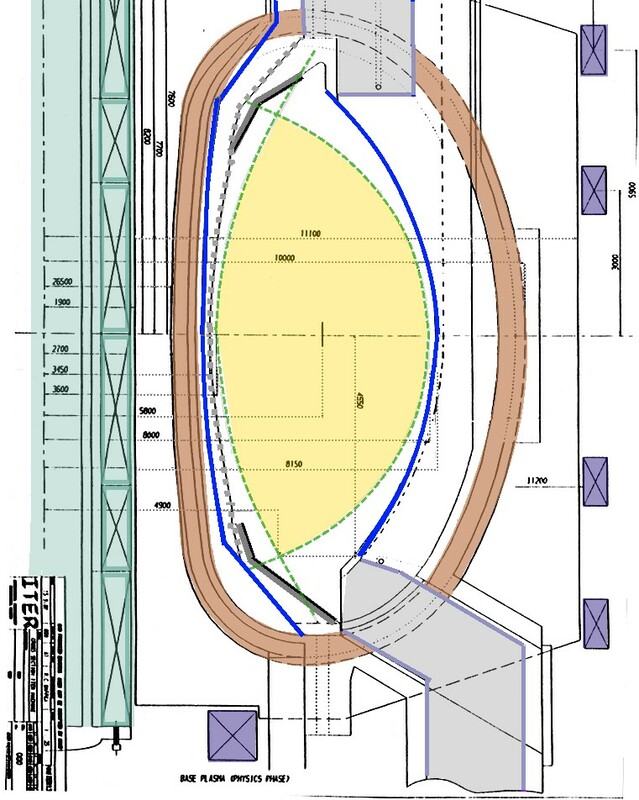 Fig 6 1988 ITER -2 divertors, open path to the exhaust ducts. Separatrix – green. Note two × points to reduce the intensity at either divertor. Divertor plates (just a sketch) – thick gray lines with black inner surface; they slant toward the exhaust vents without blockage and are close to the × points. Divertor ducts – gray paths leading into the top and bottom of the image. Over the last 35 years, there were many proposals for smaller tokamaks with higher risk of failure. They were rejected by our DOE. 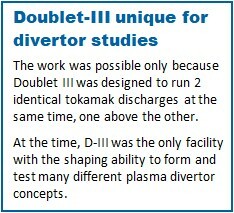 Many had divertors, but at least one was for a cheaper, divertor-less ITER. This generated answer #2, Suspicion. Expanded boundaries (XB) require a large part of the vacuum chamber for the plasma waste. This would sacrifice an expensive fraction of the main chamber; if this were the only solution, it might be a program killer. But there are (somewhat tested) divertor refinements to the basic XB. The super X divertor uses special coils to divert the exhaust away from the burning region. The snowflake divertor uses coils to generate multiple hit points on the target surface, reducing the intensity in each. The divertor blocks the out-flow of the plasma waste and the surface erosion products. The divertor may be too close to the separatrix, resulting in prolific high Z generation. Over time, backflow would poison the fusion burn. People in the fusion community understood this worry – divertor design could block steady state operation of a fusion burn (see the end of this linked article). A question has been around forever… Why build the monstrously expensive ITER? Why not one of the cheaper, smaller, more efficient designs? Imagine you are the manager – of a project to demonstrate an ignited plasma with significant power generation. You have huge governmental funding. The project must not fail; if it does, it will be a very long time before the governments of the Earth do this again. But, hey: no pressure. You could go with a very small device using high magnetic fields. It’s highly expensive – but it just might work. You could go with a very large, very expensive device that many experts (including yourself) say has a very high chance of working. With success, the follow-on could be the machine that is smaller, has higher fields, and is cheaper. Now pick. Which door would you choose? This entry was posted in Technology and tagged Doublet III, Expanded Boundary, Fusion ash, ITER, ITER divertor, ITER timeline, JAERI diverted plasma, Snowflake divertor, Steady state ITER, Super X Divertor. Bookmark the permalink.